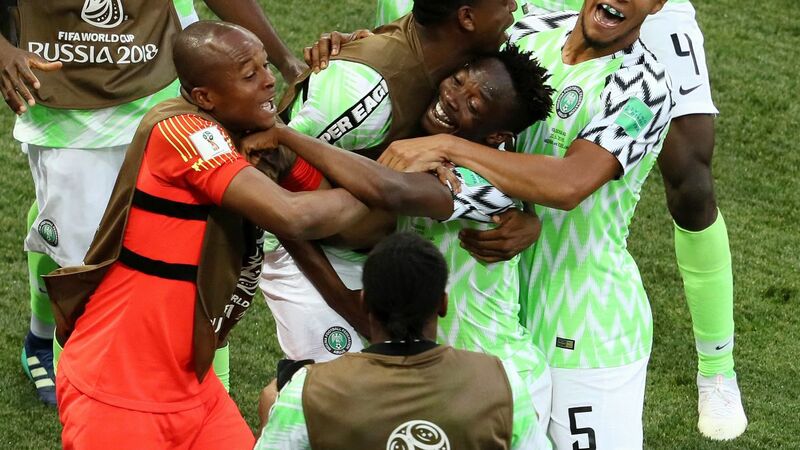 Nigeria bounced back from their opening-game defeat and boosted their chances of qualifying for the knockout stages of the World Cup, as well as Argentina's, with a 2-0 win over Iceland in Volgograd. 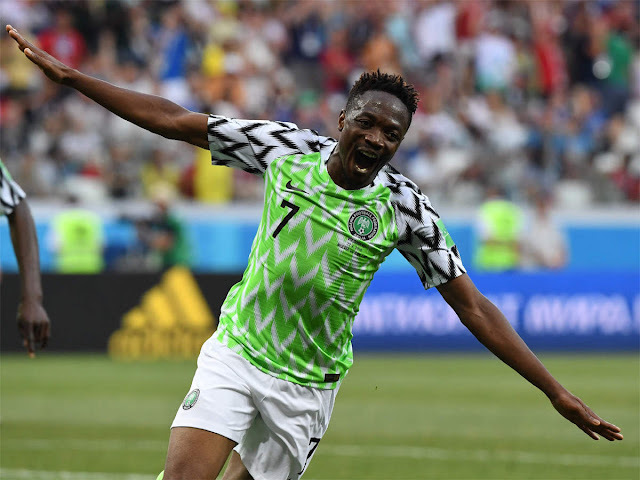 Two delightful goals from the impressive Ahmed Musa secured Nigeria a first victory of the tournament and diminished Iceland's chances of making it into the last 16. Gylfi Sigurdsson squandered a late lifeline for Iceland, botching a penalty in the 80th minute which would have set up a grandstand finish. The Everton player's profligacy summed up Iceland's day. The Super Eagles are now second in Group D and their concluding group match against two-time champions Argentina will be billed as a winner-takes-all tie. Excitingly Nigeria, Argentina and Iceland could still join undefeated Croatia in the next round, though the situation remains complicated. But should Iceland fail to beat group leaders Croatia in their final match, a draw or better for Nigeria will be enough for them to progress. Having stifled Lionel Messi's Argentina in their opening game, Iceland were optimistic of doing the same against a talented Nigeria side. The underdogs -- the smallest country to compete at a World Cup -- began promisingly. Sigurdsson tamely shot at goalkeeper Francis Uzoho early on, while Alfred Finnbogason could not connect with a venomous Sigurdsson inswinging freekick in the 44th minute. But for territory and possession there was only one team in it, though the Super Eagles lacked the dynamism to trouble Iceland in the first half. In the first 45 minutes, Nigeria did not even record a single attempt on goal. The echoes of the spine-tingling "Viking thunderclap" reverberating around the stadium in the 13th minute was one of the better highlights of a largely uneventful half. Indeed, television cameras panned to one supporter falling asleep while a soporific first half petered out. The second half was quick to entertain, however. A rapid counter attack from the Nigerians culminated with Musa's lovely half-volley. The Leicester City striker sublimely controlled Victor Moses' cross and beat Hannes Halldorsson with a thunderous close-range effort. Halldorsson had to quickly be alert to prevent the Super Eagles from doubling their lead, tipping over midfielder Wilfred Ndidi's dipping 35-yard thunderbolt. Musa then struck the crossbar with a shot from distance before brilliantly scoring his second. Sprinting down the left flank, the striker was too quick for Iceland's defence and, with Kári Árnason beaten, he cut inside, weaved beyond the diving Halldorsson to side-foot home. Referee Matthew Conger's decision to award Iceland a penalty following a VAR review -- Tyronne Ebuehi was rightly penalized for clipping the heels of Alfred Finnbogason -- could not even get Iceland on the scoresheet. Despite defeat, Iceland still has a chance, albeit slim, of progressing but beating a Croatian team which has already confidently beaten Argentina and Nigeria will be an onerous task.